DeLaneau creations showcase a great deal of sophistication and complexity. We follow the long tradition of Email de Genève, a process that preserves the colours of an enamelled dial for decades. Each of our timepieces is carefully handcrafted in Geneva using only premium quality materials in cooperation with hand-picked local experts. Protected by the iconic Atame white gold case set with 30 baguette-cut diamonds, 259 brilliant-cut diamonds, Onyx and a diamond-encrusted crown, this Grand Feu enamel dial depicts the first part of a story, produced on two separate dials. An illustration of the champlevé technique, this timepiece also features an automatic movement, a nubuck strap with a white gold buckle set with 36 diamonds, and totals 5.22ct diamonds. 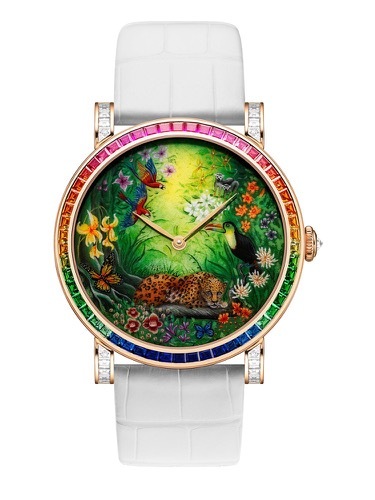 A flourishing jungle, in miniature painting, housed in a 42 mm red gold case set with a rainbow of 74 baguette-cut precious stones (8 rubies, 12 blue sapphires, 20 yellow and orange sapphires, 14 tsavorites and 20 diamonds) and 116 brilliantcut diamonds. The piece also features a diamond-set crown. It is equipped with an automatic movement and an alligator strap with a red gold deploying buckle set with 24 diamonds. This pièce unique features a total of 3.60 ct of diamonds and a 3.11 ct combination of rubies, sapphires, tsavorites and diamonds. 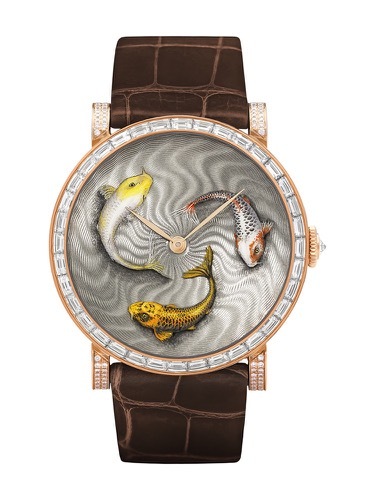 This timepiece depicts 3 kois captured in a swirling Grand Feu enamel on a guilloché dial. The 42mm red gold case is set with 36 baguette-cut diamonds, 288 diamonds and a diamond-encrusted crown. It also features an automatic movement, a mat alligator strap with a red gold deploying buckle set with 56 diamonds. This creation totals 6.01ct diamonds. The paillonné enamel technique was used for this vibrant dial. 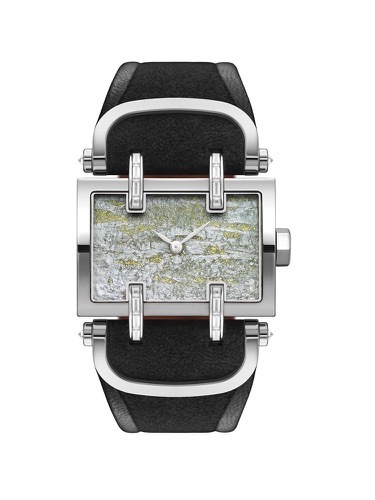 The creation features a polished white gold Atame case, 20 baguette-cut diamond clips and a polished crown. Remaining faithful to our philosophy, the sapphire-glass back is engraved with the words Pièce Unique . An automatic movement powers this magnificent timepiece. The strap is made of incredibly soft nubuck leather, and is finished with a matching polished white gold double ardillon clasp. 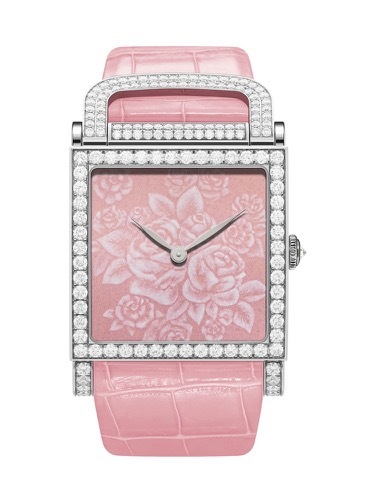 This exquisite timepiece totals 0.82ct diamonds. 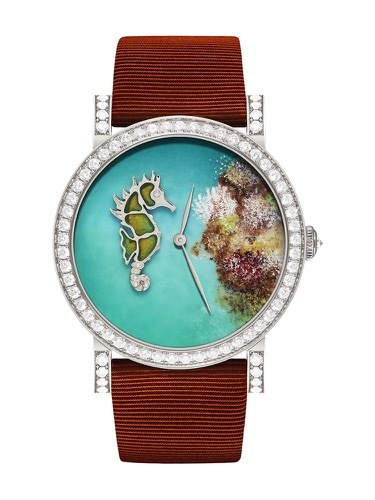 Thanks to a combination of several techniques (plique à jour, insertion of Paillons, plain and translucent Grand Feu enamel, engraving and gem setting), the dial of this amazing creation invites you to the underwater world. This outstanding creation is protected by a 42mm white gold case, set with 69 brilliant-cut diamonds and a diamond embedded crown. This timepiece also features an automatic movement, a fabric strap with a white gold deploying buckle set with two cabochons diamonds, and totals 2.57ct diamonds. This creation showcases our independence, our outstanding craftsmanship and tells yet another inspiring story. 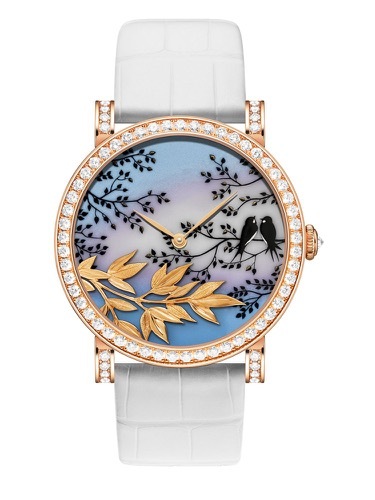 As an ode to femininity, the dial depicts a bouquet of roses reproduced with a grisaille like painting on pink enamel. 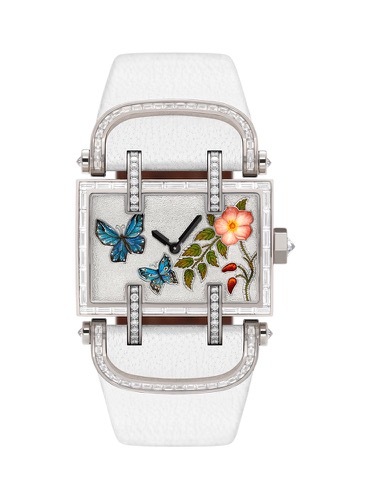 This delightful timepiece is protected by a white gold Dôme case set with 297 diamonds and a diamondembedded crown. The timepiece also features an automatic movement, an alligator strap with a white gold deploying buckle set with 24 diamonds. It totals 7.23ct diamonds. 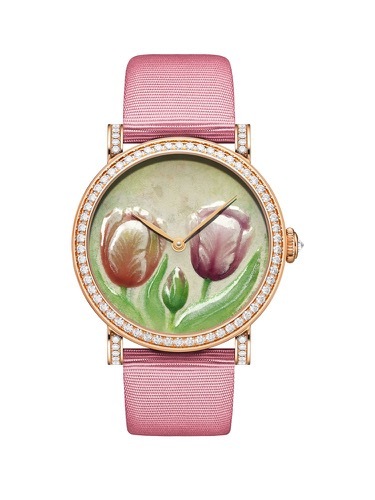 This creation captures delightful hand engraved tulips on volume enamel. Like a jazz concert blossoming to the arrival of Spring time, the colourful dial is protected by a 36mm red gold case set with 78 diamonds a diamond encrusted crown. This musical timepiece houses an automatic movement. The fabric strap is set with an ardillon buckle set with 2 diamonds. 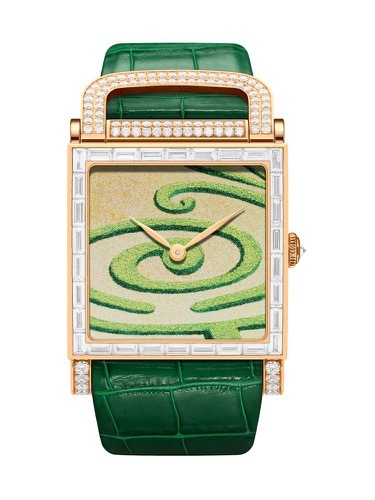 This exquisite timepiece totals 1.38ct diamonds. This creation depicts an impressionist Grand Feu enamelled topiary interpretation of an Arabesque. Protected by a red gold Dôme 40mm case set with 30 baguette-cut and 245 brilliant-cut diamonds, this timepiece is equipped with an automatic movement, a strap with red gold deploying buckle set with 24 diamonds and totals 8.89ct diamonds. 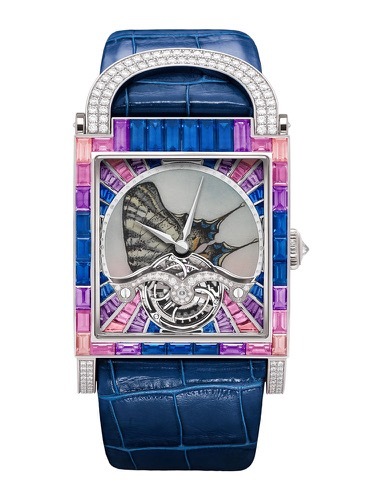 This butterfly's wing captured in Grand Feu miniature enamelled dial is protected by a white old case set with a combination of 35 baguette-cut rainbow (15 blue sapphires, 8 amethysts, 12 rubellites), 285 brilliant-cut diamonds and a diamond-embedded crown. It is equipped with a Tourbillon mechanical movement set with 52 baguette-cut rainbow (16 rubellites, 22 amethysts and 16 blue sapphires) and 24 brilliant-cut diamonds. Alligator strap with a white gold deploying buckle set with 32 diamonds. 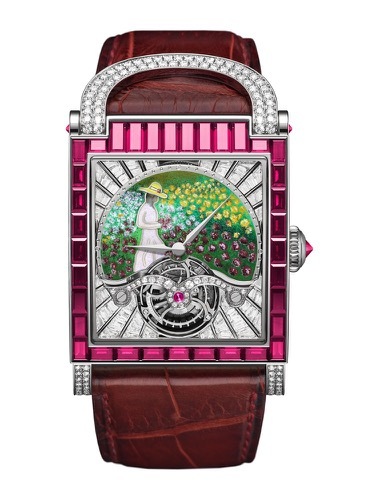 This timepiece totals 4.92ct diamonds and 7.73ct of sapphires, amethysts, rubellites. 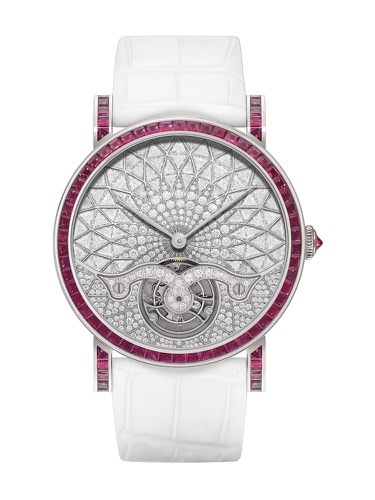 This dreamlike timepiece depicts a rosette pattern set with 76 baguette-cut diamonds and 252 diamonds. 42mm white gold case set with 74 baguette-cut rubies and 114 diamonds. Crown set with ruby. Tourbillon mechanical movement set with 21 diamonds. Alligator strap with white gold deploying buckle set with 24 diamonds. It totals approximately 8.92ct diamonds and 4.15ct rubies. Special attention has been given to minimizing the amount of visible metal in the settings to maximize the beauty and sparkle of the gemstones. This grandiose timepiece features a 40 mm x 36 mm white gold case set with 98 baguette-cut blue sapphires and 182 brilliant-cut diamonds. 2 cabochons and the crown are inscrusted with blue sapphires. 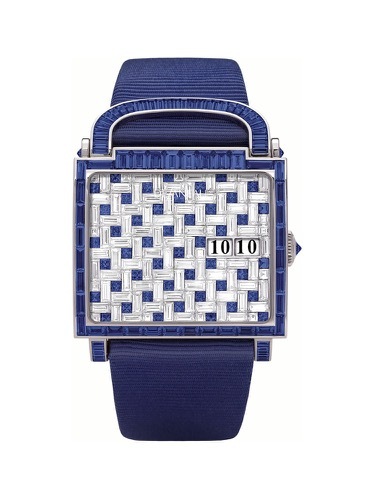 The dial is set with 140 baguette-cut diamonds and 45 princess-cut blue sapphires. Alligator strap with a white gold deploying buckle set with 32 diamonds. This breath-taking creation is equipped with our exclusive automatic jumping hour and minute movement, and totals 17.77ct sapphires and 12.53ct diamonds.